Snuffles answers his fan mail. As you can imagine, after my first post yesterday, I got tons of fanmail. Tons. Really. Anyway, I ran to D. G. D. and asked, "What do I do with this stuff?" "Answer it on the blog," he tells me. I CAN BEING GREAT TRUST WITH YOU IN PROPOSITIONAL BUSINESS DEAL OF GREAT PROFIT TO BOTH OF US.... A DEAR COLLEAGUE DIED SUDDENLY WITHOUT KIN LEAVING NINE MILLION ($9,000,000) U.S.... IF YOU AGREE TO HOLD THIS MONEY, I WILL GIVE YOU A THIRD AND TAKE THE REST MYSELF. PLEASE TO BE RESPONDING QUICKLY. My friend, you have come to the right place. We dragons are legendary, I mean legendary, for protecting treasure. In fact, hanging out with D.G.D. in his dingy one-bedroom/half-bath apartment is mostly just a weekend thing. I spend most of my time in a glorious cave in the high Himalayas where I lounge on an enormous pile of gold whilst doe-eyed ladies serenade me on harps, pull parasites out of my scales, fan me with ostrich feathers, and feed me with choice wines or the flesh of ill-fated adventurers who have dared enter my abode in the hopes of winning great fortune or the hand of one of my beauteous maidens. Okay, there you go. Oh boy, I sure am looking forward to counting all that new ill-gotten wealth. 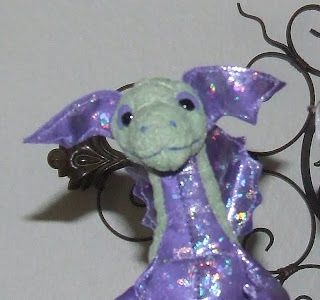 Anway, if anyone else out there wants to talk to Snuffles the Dragon, just send an e-mail to snufflesthedragon@hotmail.com. Tell 'im Snuffles sent you. And that's me. So there. Nothing makes me madder than bad manga. 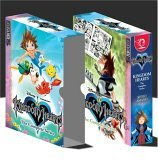 Kingdom Hearts Boxed Set--vols 1-4 by Shiro Amano. Tokyopop, Los Angeles: 2000. Based on the Disney/Squaresoft video game. This is D. G. D. popping in for a moment here. I'm pleased to announce we have a new blogger. This is Snuffles. He's a dragon. We've known each other for some time, you see, because his parents raised us together when they found me swaddled in a basket in the magic woods. Anyway, he's keenly interested in kid lit, anime, and manga, so I thought it would be appropriate to give him a space on the blog. Make him feel welcome. I'm sure you'll enjoy his charming personality. --D. G. D.
Okay, people, listen up, or...read up. Dang it, I'm not used to this whole typing thing. If you've been reading The Sci Fi Catholic for a while, you've learned a couple of things. The first is that D. G. D. is fond of sf. The second is that he's an idiot. And that's why I'm here. I can't take it anymore. But enough of that. We can call him a moron later. For now, let's talk about Shiro Amano's kiddie manga adaptation of the Kingdom Hearts video game. This manga made me so mad I had to go burn a couple of villages and kidnap a virgin to feel better. When I got back home, I found Frederick the unicorn, who's also an idiot, in the kitchen wearing an apron and making dinner (don't even ask me to describe the image of a unicorn in an apron). I verbally abused him for a while--that's how I like to unwind--until I heard the front door bang open. That was D. G. D. home from work. He started in on his annoying habit of "unloading his gear," as he calls it. that means dropping all the archaeological stuff he has on his belt or in his pockets. I'm surprised all that weight doesn't make his pants hang around his knees; once, I saw him unload his gear too quickly and the recoil gave him a world-class wedgie. Believe me, nobody wants to see that. As soon as the trowel, Leatherman knife, GPS unit, and holstered bottle of Tabasco hit the cheap linoleum, Frederick poked his head around the corner, waved a wooden spoon, and shouted, "Don't you dare drop that stuff in the hall! Put it in your room where it belongs!" D. G. D. then began emitting that high-pitched noise Frederick charitably calls "grumbling." I won't say D. G. D.'s whiny or anything, but his "grumbling" has been known to shatter windows. Anyway, the high-pitched noise stopped abruptly when D. G. D. saw me. He tried to look menacing as he demanded, "Snuffles, what is that?" "It's just a virgin I kidnapped," I answered. "What's it look like?" "Snuffles!" he shouted. "You know our rental agreement specifically says no pets!" "Then who's going to groom my scales?" I shouted back. Ugh. Well, to make a long story short, he made me take the virgin back to the village, and he made me apologize. Do you know how embarrassing it is to apologize to a village you've just burned? Probably not. 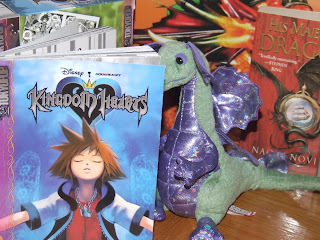 So all in all, reading Kingdom Hearts was a bad experience. It goes like this, see. There's this kid Sora, and he lives on an island. A storm comes up, he gets a powerful weapon called a Keyblade, and then he gets stuck in some shady town full of characters from Disney cartoons and Final Fantasy video games. He runs into Donald Duck and Goofy, who just happen to have magic powers and a dimension-hopping spaceship. They spend the rest of the series--that's four volumes, mind you--zipping around through different Disney movie sets looking for the missing Mickey Mouse and saving the multiverse from a band of evil monsters called the Heartless. All the while they move constantly toward a final encounter with the heart of the multiverse, which they have to close to stop the monsters from destroying everything. There's a love story in there or something, and maybe some plot about betrayal by a friend, and something about loyalty. If that sounds to you like a video game plot, you've hit on the basic problem with this manga series. Based as it is on video game levels based in turn on Disney films, the movement of events is episodic and artificial. The appearance of movie-based environments feels like an endless succession of cameos, and if there's one thing I hate in comics, it's cameos--just because you're writing a DC comic doesn't mean you need to haul out every DC character you can think of and stick him in somewhere. Nobody's impressed by that, and original characters are by nature much stronger. Well, Kingdom Hearts feels like some oh-so-clever writer is giving a cameo to every Disney cartoon flick he can come up with. This may not be Amano's fault. He doesn't own this title, so there's no telling how much liberty he has. But some of it is Amano's fault: his art style is excellent and his renderings of both the Disney and Final Fantasy characters are flawless, but the characters and convoluted subplots are severely underdeveloped. You don't so much read this comic as decode it. Half the time, you'll be asking, "What is going on?" The whole thing about hearts and darkness and multiple universes is only cursorily explained, so though the story is about a big adventure and a mythic quest, the reader is left wondering what the quest is about. This is only worsened by the heavy application of one of manga artists' greatest weaknesses--a penchant for fancy-schmancy layouts and tight closeups that make action sequences virtually incomprehensible. Since most of Kingdom Hearts is action, most of it is indecipherable. It is a very difficult read. If it were a cartoon show, it would give its young viewers severe Attention Deficit Disorder. There's a good myth buried in here, but the reader has to dig for it. Here's what Kingdom Hearts needs: clear panel-by-panel layouts, developed characters, carefully written dialogue, well-delineated plots, and a unique, well-developed world in which the action can take place. Keep Mickey, Goofy, Donald, and any other Disney or Squaresoft characters in there as warranted, but spend more time developing a unique, specifically Kingdom Hearts cast. This last, in and of itself, would make the story easier to follow. Kingdom Hearts is so bent on working all the different Disney flicks into a single mythos, the resulting plot is much more artificial and complicated than it needs to be. Having said all this, I will add that, failure though it is, Kingdom Hearts contains probably the best idea Disney's come up with since Duck Tales, and certainly the best collaborative effort they've done since Who Framed Roger Rabbit. The image of Donald, Goofy, and a manga character in hand-to-hand combat with monsters is instantly appealing. Kingdom Hearts exploits one of the greatest, strangely underutilized strengths of cartoons and comics--the ability to put very different characters in the same visual space. This produces an instant charming effect unattainable with any other medium, though puppets sometimes come close. The end result is that Kingdom Hearts is all the more frustrating because of its many failures. Ergh. Now if you'll excuse me, I've got to go burn some villages. A brief, selective art history on angels. Angels: National Gallery Pocket Guide by Erika Langmuir. National Gallery Publications, London: 2002. 80 pages. Illustrated. ISBN: 0-300-07923-0. I picked this up on impulse at a nearby college library while researching an unrelated topic. It's a discussion, copiously illustrated, of angels in paintings in the National Gallery of Britain. It's an easy read, respectfully written, giving a brief history of angels in Christian thought and artwork. It explains some of those questions you may have asked, such as, "Why do cherubs appear in paintings as babies?" Well, according to Langmuir, this phenomenon appears in the fifteenth century and probably derives from images of Cupid with Hermes. Langmuir discusses a number of other interesting angel/art-related subjects as well. The traditional nine-tiered hierarchy of angels, for example, comes from a few phenomena related to the translation of the Hebrew Old Testament into Greek, a New Testament passage or two, and pseudo-Dionysius. I'd wondered about that. Paintings illustrated in the guide, in full color, include works by Botticelli, Corregio, and Rembrandt. If you have a lazy Sunday afternoon to spend, you could spend it worse than by looking over Angels. Someone asked me about the abortion petition I had up earlier. I got it through e-mail, but when I posted it, it had my private information in it, so I had to take it down. Now I'm having trouble finding it; I suspect the petition is over, but I'll do better posting the next one. Also, if you're here from Boneville, wondering where part 2 of "The Vivisection of Bone" is, I can announce that the rough draft is well underway. This one is taking more research and I'm in the midst of a book I'll be using for it. It might be up tomorrow but I make no promises. You might not want to live inside this book. Hollow Earth by David Standish. Da Capo Press, Cambridge: 2006. 303 pages. ISBN-10: 0-306-81373-4. If you not only read sf but read about sf, take a look at Standish's Hollow Earth. Though not intentionally focused on science fiction, he spends most of his time talking about it. This book is a short history of hollow earth ideas from the time of Sir Edmond Halley to the present. To explain abnormalities in the Earth's magnetic field, Halley proposed that the Earth is hollow, and things haven't been the same since. Standish describes the misbegotten notions of John Cleves Symmes, who believed and taught, for no good reason, that the Earth is hollow and has openings at the poles. He discusses Jules Verne's Journey to the Center of the Earth and makes a convincing argument that Verne plagiarized large parts of it. Probably his most interesting chapter is on Cyrus Teed and the religion he founded, Koreshanity, which teaches not only that the Earth is hollow but that we're living on its inner, concave surface. His description of the religion is lucid, apparently well researched, and generally free of Standish's sarcastic comments, which grow old after a few chapters. The basic purpose of Teed's religion, apparently, is to replace a fathomless universe with one finite, comforting, and womblike. From that point forward, the most interesting parts of the book are over. Genuine hollow earth theories are replaced by a parade of science fiction stories, which Standish summarizes. He spends extra time on the Pellucidar stories of Edgar Rice Burroughs, beginning with At the Earth's Core . He's hard on Burroughs, though admittedly, Burroughs novels, exciting at first, get dull after you've read three or four of them, and Standish apparently read every Pellucidar novel he could get to write this chapter. That could leave a man frustrated. Hollow Earth eventually peters out with a few New Agey things off the Internet, specifically dealing with the underground New Age paradise of Agartha. Unfortunately, Standish doesn't spend much time giving the details or history of this myth. The book would be more enjoyable if Standish didn't have such a wiseguy attitude. In particular, an absence of sarcasm would have made his errors more bearable. He mistakenly characterizes The Lord of the Rings as a hollow earth story, apparently led astray by the term "Middle Earth," which Tolkien borrows from the Norse mythology that constitutes his major source. Standish also dismisses all (all, mind you) thought before the Enlightenment as "dreamy romanticism," which is ridiculously inaccurate. Standish comes across as feeling awfully high and mighty for having the privilege of living in the modern age and having his personal opinions. His attitude is sometimes insufferable. For those who like to know the history of sf ideas, this book is worth reading in spite of its drawbacks. To Standish's credit, his summaries of sf novels never quite grow entirely wearisome. April's edition of the Christian Science Fiction/Fantasy Blog Tour's newsletter, Latest in Spec is available for your perusal. You can read it here. It includes news on events, book reviews, awards, and so forth. Good to look at. Also with the newsletter is an announcement for the Fantasy Fiction Tour 4 featuring Bryan Davis, Wayne Thomas Batson, Sharon Hinck, and Christopher Hopper. You can get tour information at the tour's official website, here. Samsung has announced the development of a new robot designed to patrol dangerous borders and shoot bad guys. A brief though well-written article on the ethical issues related to the development of such robots is available at MSN. It is getting to the point where science is moving ahead so rapidly the science fiction writers are behind. Perhaps that's why fantasy is doing so well these days. Before you marry the guy, better find out what he's got in the attic. Jane Eyre by Charlotte Brontë. Puffin Classics, London: 1995. 656 pages. ISBN: 0140366784. If you're a guy and think you couldn't possibly enjoy this book, try lavender and tea tree oil. It worked for me. I'll begin by saying it's a good deal better than her sister's Wuthering Heights , which I didn't care for. Jane Eyre is a first-person narrative following the titular protagonist through boarding school (mercifully skipping several years) and into her job as governess at the mansion of the surly Mr. Rochester, with whom she quickly develops a romance while remaining oddly unconcerned with the murderous crazy person Rochester is keeping in his attic. As in Wuthering Heights, there's a breath of supernaturalism as the story moves to its conclusion. Come to Jane Eyre for the good prose and stay for the fantastic characters. Brontë's writing is precise and her images evocative. You will never see a prettier use of colons and semicolons. But more than that, she creates a diverse cast of characters with fully developed personalities. Since we sf writers and fantasists often prefer to build characters by layering them with eccentricities, Jane Eyre makes for a good study. None of the characters are especially eccentric, but all are well crafted and absorbing. I am particularly impressed by her depiction of a Calvinist minister in the novel's latter third. Though he has some of the dour qualities of a stereotypical literary figure of that occupation, such dourness is shot through and almost eradicated by a number of complexities and redemptive qualities. Lots of religious imagery is present. It's hard to get a firm handle on exactly what brand of Christianity-based religion underpins the story, but from certain characters and turns of phrase, I would guess a sort of universalism, though unlike, say, George MacDonald, Brontë doesn't let universalism wreck her story (MacDonald would have had a fine tragedy in Lilith had he allowed it). The ethics and piety are quite high in Jane Eyre, especially the respect for marriage and virginity. In fact, I officially add it to The Sci Fi Catholic's official list of literature good for inspiring chastity. Requirements for the list are good ethics, marriage or virginity as a central theme, and a significant emotional impact. The last quality, of course, is subjective. Check out Locus Magazine's list of new books from the second week of April. Looks like some interesting stuff has come out, including a new Oxford dictionary of science fiction. When's the last time we had a book review around here, anyway? Neotopia by Rod Espinosa. Four volumes: The Enlightened Age, The Perilous Winds of Athanon, The Kingdoms Beyond, and The New World. Antarctic Press Pocket Manga, San Antonio: 2004. If manga, Star Wars, The Lord of the Rings , kung fu films, swashbucklers, Dinotopia , and sword-and-sorcery all got together and had a kid, that kid might look something like Neotopia. In the distant future, pollution, lack of resources, and man's inhumanity to man have led to the collapse of the Age of Heavy Industry. Out of the ashes of the old world arose a new world, Neotopia, a time when man has learned to live in harmony with nature. Joining humans in this new, enlightened civilization are the magical elves and fairies formerly banished from the humanity's mechanized society, as well as numerous animorphic extraterrestrial races trapped on Earth for no particular reason. In the enlightened kingdom of Mathenia, Crown Princess Nydia is a spoiled brat who would rather spend her time going to lavish balls than going to school, learning combat training, and preparing to be Mathenia's empress. To escape her duties, Nydia forces her servant Nalyn to dress in her clothes and, with the help of fairy glamour, imitate the crown princess. Unbeknownst to Nydia, Nalyn, a much more intelligent and generous person, is slowly stealing her entire life. And Nalyn is about to get more than she bargained for when she accepted this deal. The neighboring empire of Krossos, a last vestige of the Age of Heavy Industry, begins an all-out war on Neotopia, which will propel Nalyn to the role of military leader. Captain of the floatship Intrepid Explorer, she and her oddball crew, including aliens, a brownie, a psychic dolphin, and an android, among others, will embark on a desperate quest to rally the scattered Neotopian nations together to beat back the Krossian invasion. Nalyn's tough but likable (and oddly gullible) character indicates Espinosa is fond of grrrl power, as he further demonstrates with The Courageous Princess and Battle Girlz . Central to the comic is Espinosa's impressive art. He has a degree in Architectural Drafting, and it shows. His landscapes, architecture, and costume design are an inventive, highly detailed blend of styles complemented by impressive digital color. All of this adorns a lush world full of creative machines and strange people. There's lots of eye candy in Neotopia; It stands with Dinotopia and Robota as one of the most fun fantasy/sf books to look at. And like those works, it suffers somewhat from weak writing. The only real drawback to the art of Neotopia is the "Amerimanga" style. In imitating manga, Espinosa matches many of the Japanese comics' strengths, but he also matches some of their weaknesses. His characters have a range of about four facial expressions, and talking balloons often float around with no clear attachment to a speaker. Espinosa does, however, refrain from closeups so tight you can't tell what you're looking at. By far the greatest problem is not Espinosa's fault, but his publisher's. These volumes are so small, you'll want a magnifying glass to read some of the dialogue. This shrinking is especially detrimental because of the quality of the artwork. There's lots of good stuff in the Neotopian universe, but the centerpiece is undoubtedly the floatships. They look like big boats with elongated balloons in place of sails. They float on water, sometimes dive under the water, and also fly through the air. This gives Espinosa opportunity to combine old-fashioned swashbuckling with numerous physics-bending aerial stunts. Why board an enemy ship by crossing a plank or swinging on a rope when you can do it by skydiving? He has to make some ridiculous explanations of why aerial battles don't pop the ships' balloons, though. Most of the series consists of a whirlwind tour of Neotopia as the Intrepid Explorer and her crew visit each of the enlightened societies in turn, braving hazards, fighting skirmishes, and developing formulaic romances on the way. The plot and characters are all conventional. So big is the epic story that it often feels rushed: Espinosa wipes out an entire race of elves in about three panels, for example, and then brings them back in the epilogue (!). The story also features a clichéd romance, and the plot ends with some forced "twists," one of which is a cheap, though effective, tear-jerker. Complicating matters is the gigantic cast of villains who are indistinguishable in personality as well as appearance. The book might have done better with one evil emperor and one nasty general (a Palpatine-Vader duo) instead of a huge committee of evil emperors and three or four nasty generals, not to mention several quislings and traitors. Like a high fantasy, the story ends with a big battle sequence occupying most of the fourth volume. In a high fantasy, however, the final battle is just scenery because the important thing is the magic doohickey that's either the villain's one weakness or the source of his power. In Neotopia, the final battle is actually important and decisive, though it still follows conventions: The villains make boneheaded moves such as sending their allies into the front and withholding air support just to show how nasty and callous they really are, and the heroes have unexpected allies who show up at the last minute. The conventional epic storyline prevents Espinosa from exploring his world's complexity. As the Intrepid Explorer visits each Neotopian land in turn, the Neotopians' claims of enlightenment sound increasingly hollow. Eriden, for example, looks like a genuine paradise, but as it turns out, its inhabitants maintain their leisurely, idyllic lifestyles with the help of a massive slave labor force. The Lesazonians, in turn, are a race of vicious womyn who "cleanse" male-dominated societies with mustard gas and smart bombs. By the end of the story, the battle between Krossia and Neotopia is not so much a battle between evil and good as a battle between evil and less evil. In all this, Espinosa shows more wisdom than James Gurney, author and illustrator of Dinotopia, who suggests that humans would give up war and greed if they only hung out with talking dinosaurs and memorized platitudes like, "One drop raises the ocean." Espinosa, by contrast, depicts a better world in which human nature hasn't changed; Neotopia is flawed, and it maintains its precarious balance only through strict laws governing technology and scientific inquiry, laws that all Neotopians, one way or another, break. This doesn't prevent Espinosa from an occasional lecture about abuse of the Earth. Claim is that eco-friendly technology would have been available in the Age of Heavy Industry if money-grubbing powermongers hadn't kept certain scientific secrets to themselves. Such lectures would be easier to take if Neotopian technology didn't include such things as perpetual motion machines and electronics powered by the human aura. Espinosa's vision of science is not quite as clear as his vision of people. Espinosa's mature, realistic view of humanity may derive from a religious background. I don't pretend to know his religion, and I'm of the opinion that trying to guess an author's religion from his fiction is a good way to embarrass yourself. The Neotopians for the most part follow some form of polytheism, though no specific deities are mentioned. Espinosa himself, however, begins his acknowledgements at the end of the fourth volume by thanking God and ends by thanking his St. Matthew's Church Group. Neotopia's climax includes an event clearly inspired by the story of David and Goliath, probably the comic's only definite religious image, though a scene at the end reminds of some of the horrible experiments of the N.I.C.E. in C. S. Lewis's That Hideous Strength . The story is wholesome, sometimes inspiring, occasionally thoughtful, and fit for all ages. Neotopia is definitely a world worth visiting. John C. Wright has found himself on the geek hierarchy. Let's see. I have two short stories published on limited circulation e-zines...is that enough to put me at the top? Where else do I belong...well, admittedly, I once wrote a very long work of Bone fan fiction (I know, don't say it). And no, you can't read it because I took it off the Internet because it violates copyright, and yes, many ideas in the fan fic went into that big essay. I guess that puts me pretty close to the bottom of the hierarchy, but I didn't write "furry" fan fiction. I don't think I even know what that is. Not to brag or anything, but Jeff Smith over at Boneville has written some very nice comments on my essay on Bone. Considering that it is with Bone I at last discovered my true geekiness, this just tickles me pink. Check out The B-Movie Catechism. This guy is, like, my doge. He does much of what we do here, only his focus is on B movies. His reviews are awesome, giving further evidence to my hypothesis that highly intelligent individuals prefer lousy films. Incidentally, I owe him for that neato countdown to the Robot Apocalypse widget. We've also added Calls for Cthulhu to the Sci Fi Blogroll. If you don't know your Lovecraft, you won't get it. If you do know your Lovecraft, it's hilarious. If you take your Lovecraft way, way too seriously, you'll hate it. If you ask, "Is Lovecraft a dirty book?" Ray Bradbury beat you to that joke. 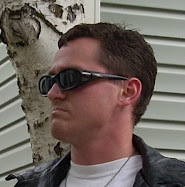 John C. Wright's Online Journal has been way overdue for our Sci Fi Blogs list. Not only is the man a Christian convert and sf writer, he is dang funny. You may note, also, a new Catholic Blogs search engine and daily Mass readings under the Catholic Blogs list. Why, you ask? Well, partly because I like cool widgets, but also: the first is for convenience, and the second is because this blog is about reading and the daily Mass readings are a way to read with the Church. And thanks to our good friend at Claw of the Conciliator for pointing out the new entry to the Sci Fi Resources. It seems Project Gutenburg has a bunch of old public domain sf available on the web, so you can read all the great stuff from before your time. Me, I'm going to see if they have a copy of "The Machine Stops." That story was awesome, anticipating post-acceleration sf by, like, a century. D. G. D., like Cthulhu, will answer your e-mail. anyone to give me more information to lead me astray. Yes, there is a place. A happy place, where...oh, wait. Lost my train of thought. Well, the world is a dangerous place, and Fäerie is more dangerous still, so I can't help with that, at least at the moment. But here is my response to the e-mail, slightly edited. That's an interesting question. I don't think it has an easy answer. I spoke to a priest recently about the issue. Being a writer, I'm obligated to read. This priest suggested that it's not good to read anything that "stirs up" obvious temptation. That's my first answer to the question. You need to use good discernment and a well-formed conscience to determine exactly what that is. The answer then is to stop reading anything you're reading that you think you shouldn't be. The second answer is to read actively. Don't approach anything you read or watch without seriously considering it and thinking about what it means. I don't think that means you need to try to draw an anti-Christian spin out of anything you read, but it does mean you need to seriously consider what you're reading, trying to pick out both positive aspects and deficiencies. Anything you read will contain both. Also, seek out wholesome books. That may mean some trial and error. As for Neil Gaiman, I can't help you much there because all I've read of him so far is his Sandman comics, which is probably the sort of thing you're trying to avoid. His children's books are likely cleaner. As for anti-Catholic rants, if you're strongly Catholic, this may not be a serious problem. It may even inspire you to learn more about the faith and how to defend it. I'm not trying to encourage you to read books that might damage your faith, of course, but speaking purely from personal experience, I think Pullman's His Dark Materials probably encouraged me to become Catholic, and Stross's Glasshouse has encouraged me to be a stronger Catholic. Both of them present cartoonish anti-Catholic rants of the sort that are relatively easy to dismantle, and the process of dismantling them gets me thinking seriously about my faith. You may not wish to read Glasshouse, though, because it has a lot of sexual content. In the non-fiction section, find some works with good overviews of Catholic apologetics for starters. Though, again, I don't want to encourage you to read anything you think you shouldn't, getting a solid base of Catholic doctrine and apologetics will greatly lessen the impact of any reading you might encounter that will raise doubts. Another thing I might add while I'm thinking about it is, read books that inspire chastity. This is necessary whether you're reading sf or not. Get some good overviews of The Theology of the Body, like a DVD series or a book by Christopher West, and then follow that up with some reading that depicts marriage or romance in a wholesome way and carries the sort of emotional impact that makes it stick in your mind. Paradise Lost is reasonably good on that side of things, and it's something everyone ought to read anyway. I'm just about finished with Jane Eyre, and though I don't care for it too much, I know a lot of women do, and it seems to be wholesome and I'll probably recommend it. I think Bone is good for this if the reader has a solid Catholic foundation, though it probably has a heavier impact on male readers. I know Lewis recommended The Faerie Queene, but I haven't read it yet; it does contain some anti-Catholic allegory, but that's probably not much of a problem. On the less-reading-more-praying side of things, keep Jesus always before your mind's eye. Final day of the blog tour, so get over to the bookstore and get your Karen Hancock on this thing. Return of the Guardian King is this month's feature novel. Hancock's official website is here. Her blog is here. But now get over to From the Shattered Drum where Keith Strohm has up an excellent essay on what’s wrong with Christian sf and fantasy. He has obviously thought hard on the issue, and his post is well worth reading and mulling over. This post is similar (it’s a conspiracy, see? ), but his thoughts are better developed on the matter. My own thought parallel his, but also diverge at certain points. First of all, Keith speaks of “enclaving.” That is, producing secular things for an explicitly Christian audience and ignoring the rest of the world. In the U.S., at least among Protestants, this kind of enclaving began in the 50s and continued through the 70s. Dispensationalist Evangelicals, who are among the biggest movers and shakers of American Christianity thanks largely to C. I. Scofield, went underground in response to the 60s counterculture, doing their own thing and praying for the Rapture. They came back with a vengeance in the 80s with the birth of the neo-con movement, thereby reawakening the sleeping leviathan of liberal Protestantism, sparking the so-called New Quest of the Historical Jesus, and more-or-less giving us the religious landscape Americans enjoy today. The 1980s also saw what I call the Mini Witch Hunt. This involved a sort of paranoia about what is usually dubbed the Occult, a term with which I’m uncomfortable because it implies a monolith whereas this “Occult” actually contains an assorted mishmash of real history, phony history, folklore, parlor games, new religious movements, and so forth. Under the umbrella of this sinister-sounding catchall term were such things as fantasy novels and Dungeons & Dragons. Though I can’t claim to have traced the far-reaching effects of enclavism, neo-conservatism, and the Mini Witch Hunt, I propose as a hypothesis that the unreasonable animosity against Harry Potter and, when Rowling’s detractors can name any, other works of fantasy, is a continuation of the attitude of the 80s. I confess Catholics haven’t been immune to it. I am guessing this generally suspicious attitude toward fantasy, combined with a still-present enclavism, is responsible for the rise of that peculiar genre known as Christian sf and fantasy. This branch of literature seemed to be having a mini-Renaissance about ten years ago when a number of Evangelical leaders suddenly became novelists. The renaissance climaxed with Left Behind , a groaningly awful, endless set of apocalyptic books that I assumed would kill the genre in spite of its sales numbers. I was wrong. The genre seems to be doing quite well. Keith’s biggest complaint against the Christian sf/f community is one of enclaving; he sees Christian sf/f as being incapable of changing the world at large. In other words, the writers of this kind of fiction write only for committed Christians when they should be writing for everybody. They are, to coin a phrase, preaching to the choir. I cannot object to explicitly Christian writing. I cannot, as Keith does, object to Christian allegory. I cannot because to do so would be to deny some of the greatest works in our literature, especially Paradise Lost . What I will object to are ham-fisted allegories and bad Christian writing. Bad writing only gets worse when a religious message is crammed into it. It’s evident from the success of Left Behind that popularity of explicitly Christian novels outside the Christian community is possible. It’s even possible when the writing is bad and the theology eccentric. Frank Peretti, who I regard as a highly talented writer, also had a crossover success many years ago with This Present Darkness . In that case, the writing was quite good. Only the theology was eccentric. Besides these successes, I see writing with heavy Christian themes outside the Christian sf/f genre. One of my favorite comics is Kingdom Come , which makes heavy and positive use of Christian imagery. Elliot has recently pointed me to Eifelheim , which I haven’t read yet, but which sounds like a positive Christian-themed work. Connie Willis regularly has heavy religious themes in her writing. Not all of them are positive, but she’s not a Christian-basher, either. The 2005 volume of Year's Best SF contains a positive Christian story by Ken MacLeod. What I’m getting at is, there are many views on religion in the sf and fantasy field because the field is diverse. The question is, then, is the ghetto into which Christian sf/f authors have placed themselves one of their own creation? Or is the ghetto necessary, as the sf ghetto once was, because secular publishers will not accept work with Christian themes? Dedicated Christians may indeed have a harder time publishing. I won’t deny that. But through religious publishing houses, too many Christian writers have published bad books they never should have been able to publish in the first place. The result is a genre generally characterized by bad writing, a genre most non-Christians won’t bother with. From the looks of things, that situation may be changing and the writing quality may be getting higher, but that won’t bring down the walls of the ghetto; it will only make the ghetto’s contents less painful to look at. First, they must read widely. There is no excuse for an author who does not read. You must go the source material. That means reading things that, if you’re of a Fundamentalist branch, are considered part of “the Occult.” You must read pagan mythology. You must read folklore. You must read history. You must read the great poets. You must also read some Catholics. The Chronicles of Narnia , The Lord of the Rings , The Pilgrim's Progress , and the Bible are a good start, but they are not a foundation for a writing career. This holds true whether you intend to write fantasy or something else. Second, they must not preach. This is a hard temptation to resist. I have on my floor a 600-page unpublishable manuscript chock full of magic, action scenes, and sermons. I can’t hardly stand to look at it any more. I might be able to sell it to Tyndale, but I’m going to resist that temptation. Though I love a good sermon, it belongs at the lectern. I have said it before and I will say it again: We get everything backwards today; we write sermons in our novels and tell stories from our pulpits. If you feel the urge to convey a message in your novel through a sermon, what you want to say either doesn’t need to be said or else you haven’t done enough world and character development. Third, Christians must overcome newly developed literary hang-ups. Most people interested in writing sf probably don’t suffer from this, but I will say it anyway. A certain prudishness has developed among Christians of late. I attribute it to enclavism, general illiteracy, and a well-meant but poorly aimed gut reaction to Harry Potter. Many Christians fear or dislike such things as tragedy or imaginative fiction. Some even dislike any kind of fiction. Some dislike any kind of literature except the Bible. All of this is a bad starting point if you want to write good literature or produce any kind of quality art. Fourth, bibliolatry in fiction looks stupid. I apologize for the term here, but bibliophilism was too broad. If your characters find the Bible holds the magic answer to all their problems, your novel is dumb. I’m sorry, but that’s just how it is. Show your characters some respect and let them have more complicated lives than that. The best way to use the Bible in fiction is to soak in it and let what you pick up flow out naturally through your pen in mythic archetypes, in symbols, or even in turns of phrase. And please, please, please don’t write a book where nothing religious happens until the very end when the characters pick up a Bible, get saved, and die. That’s right up there with the it was all just a dream ending. Besides, I hate to break it to you, but a person who’s never heard of Christianity and picks up a Bible and reads it straight through might not come away with your theology anyway. If you’re Protestant, nobody came away from the Bible with your theology until the sixteenth century. Fifth, avoid the Perfect Pastor. He shows up in a lot of Christian sf. He is the pastor of some church, has no faults whatsoever, and acts as the mouthpiece of the author, frequently spouting theology and sometimes conspiracy theory that is bizarre by any sane standard (I first learned from Christian sf that the Illuminati, the Freemasons, the Rosicrucians, and the Satanists are part of a global conspiracy out to get us). I think Perfect Pastor often backfires not only because his sermons disrupt the story but because he typically comes across as self-righteous rather than righteous, especially if his theology is very eccentric and his monologues very preachy. Sixth, you need a solid Christian background. Most of the Christian sf books on the shelf are Protestant Evangelical. I suppose Evangelicals have as much right to write fiction as anybody, but when fiction is focused on religion, it needs solid, well-developed religion on which to focus. The kind of Evangelicalism practiced by many of these authors is too shallow to have real impact. They treat the name Jesus like a password to Heaven. This looks ridiculous in fiction, which indicates something is probably wrong with it in real life. I have commented on occasion that Frank Peretti is a good author but would be a great author if he only became Catholic. I say this because his good plots, tight action, and excellent prose style are offset by some remarkably shallow religious thinking (though he’s best when criticizing Pentecostals). Take a look at C. S. Lewis’s Perelandra for a good Protestant sf novel. Lewis was a high Anglican and a literary scholar. Had he been a pop Christianity American Evangelical, he never could have written such a book: it combines Christian apologetics, thorough world development, highly symbolic commentaries on Paradise Lost and the The Divine Comedy , and some nail-biting action. But it’s never preachy. Seventh, your book is not a vehicle for your religious weirdness. Sometimes the theology of a Christian sf novel is so bizarre, it...well, it’s bizarre. Left Behind is a pretty good example of this. I wouldn’t so much mind the idea of all the Christians suddenly disappearing if LaHaye didn’t take it seriously. But to be fair, I’m going to use a Catholic novel as an example of weirdness. The novel I have in mind is Bud MacFarlane, Jr.'s Pierced By A Sword . The first two thirds of the novel is a repetitive set of character bios, and after that, most of the action is told through the narrative of a history book written after the fact. The hideous organization isn't all, though: He hauls out the so-called "Three Days of Darkness," a sort of Traditionalist Catholic Rapture (not recognized by the Church, by the by), and burns all the non-Catholics off the face of the Earth. So Jesus can return? No, oddly, Jesus never shows up. It's so the Middle Ages, or MacFarlane's fictional, romanticized version of them, can return. Then the Catholics can live in a nice, happy world where there are no non-Catholics to worry about and nobody criticizes the Catholics for writing bad sf. It's a reprehensible book all around, the final moral of which seems to be, "Don't you wish we could all just be spiritually lazy?" A priest once asked me for my opinion on the novel and I told him if I had not read Piers Anthony's Total Recall , it would be the worst book I'd ever read. So, this is the advice column. For the clearly laid out opinion column, go read Keith Strohm’s post.